people liking hate a n d violence: mostly men. "Cold" haters with violence: so-called "psychopaths" (clinical definition: people who lack empathy and compassion). These people can switch off their "mirror neurons" completely (if you are not familiar with "mirror neurons", please google it). Psychopaths and pedophiles are, in my opinion, probably the most dangerous kind of people on this planet. "Hot" haters with violence: they are certainly deeply traumatized. I now from myself that when certain traumas (usually from childhood) are triggerd you can get such enormous physcial and emotional pain that you really want to take a gun and go out and shoot people (read the childhood biographies of Stalin and Hitler and you will understand why they became devils - they had enough genius to become devils for millions of people). Of course children and teenagers having this potential should be picked out by routine obligatory psychological test for everybody in schools (it should not be very diffult to find this out) and get psycholgical treatment. Porposal for treatment, even of grown-up people (old Buddhist wisdom, not invented in modern times): 1. make them aware of their deep anger (many suppress it so miuch that they don't even realize it), enough techniques are available for this. 2. Let them spit out their anger in words (e.g. screaming and yelling), fi necessary even in non-harming deeds, like smashing things in special suuroundings. 3. Most important step: make them turn their anger into a c r e a t i v e force. Show them that desctruction does not give good results and let them invent their own ways to turn this powerful emotion into something constructive (ask Buddhists or really good psychologists for further information, I myself have found my own ways, but different people might need different ways, and their is not enough room here to discuss this in detail). I hope this can give some hints how to solve the problem. I am sure if there really were a sincere effort to handle this in a productive way by non-idiotic skilled persons, it could be done. Please forgive any typos - I did not proofread (too tired). 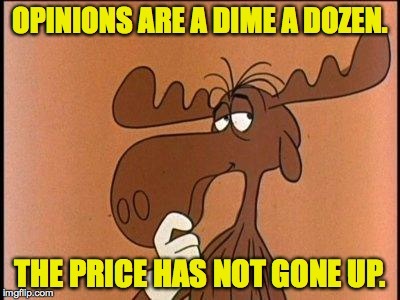 OPINIONS ARE A DIME A DOZEN. THE PRICE HAS NOT GONE UP.